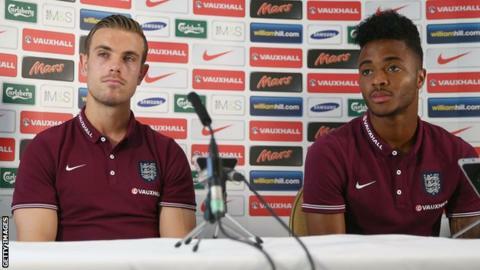 Liverpool's Jordan Henderson says it is time for England's young players to step up and show what they can do. Manager Roy Hodgson has picked a youthful squad to face Norway on Wednesday as England look to bounce back from a poor World Cup campaign. Henderson, 24, said: "It's time for the younger lads to step up to the plate and show what they've got to offer." The midfielder added: "There is a lot of talent in the group. It doesn't really matter how old you are." England finished bottom of their group in Brazil, scoring two goals as they failed to win a game - losing 2-1 to Italy and Uruguay and drawing 0-0 with Costa Rica. Veteran midfielders Frank Lampard, 36, and Steven Gerrard, 34, retired from England duty after the tournament and the Three Lions are looking to rebuild for Euro 2016. Wednesday's friendly with Norway at Wembley is followed by their first European Championship qualifier against Switzerland, in Basel, on 8 September. Henderson, who featured in two World Cup games, said: "As a team, we felt we let the fans down. "But every time we put on that England shirt, it means everything to us and we give 100%. We'll do our best in the coming games, as we always do." Manchester United striker Wayne Rooney takes over as England captain from the retired Gerrard, and Henderson believes the 28-year-old, who has 95 caps, is the "ideal choice". He said: "He is a natural leader in the dressing room and also on the field. So I think that was a really good appointment. "He gives 100% whether that be in training or in matches and also he will help the younger lads. He has got a lot of respect in the dressing room." England have been drawn in Group E - along with Switzerland, Slovenia, Estonia, Lithuania and San Marino - for qualifying for France 2016.